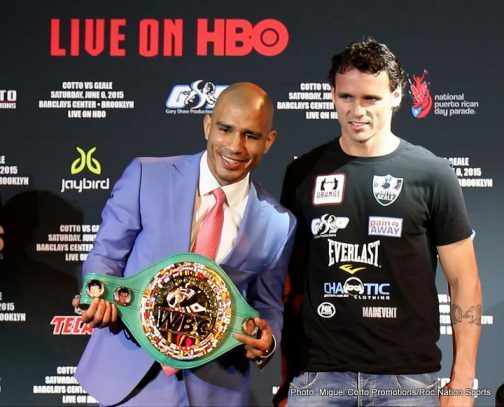 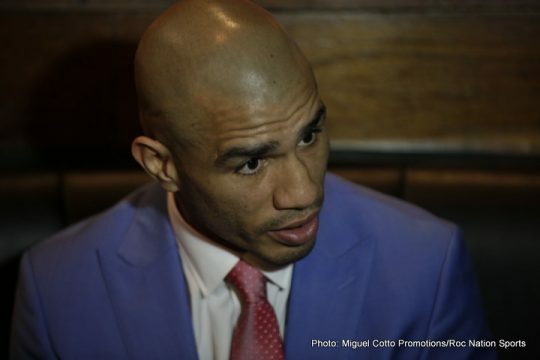 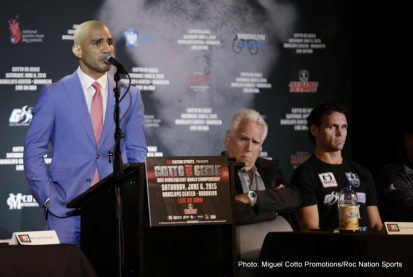 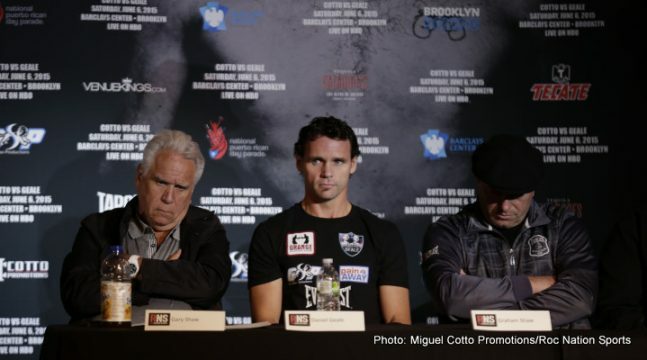 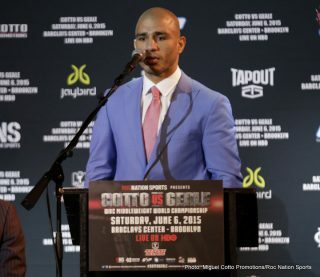 Roc Nation Sports and Miguel Cotto Promotions hosted the final press conference for the June 6 showdown between WBC and Ring Magazine Middleweight World Champion Miguel Cotto and former Two-Time World Champion Daniel Geale on Tuesday, June 2 at B.B. 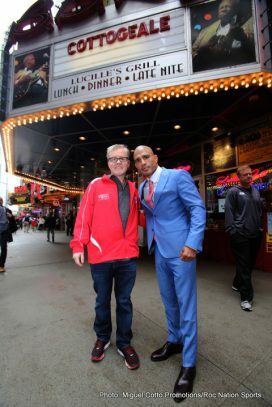 King Blues Club & Grill in New York City. 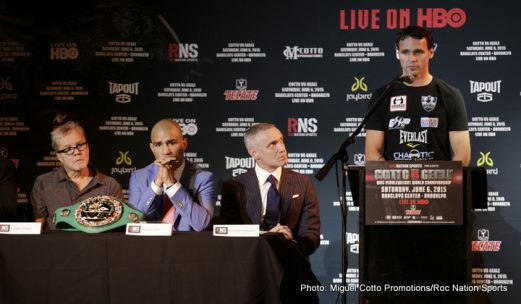 Along with the main event participants, undercard fighters Junior Younan and Zhang Zhilei were also in attendance. 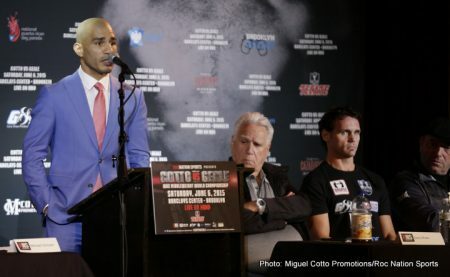 Other speakers included Michael Yormark (President & Chief of Branding and Strategy of Roc Nation), Hector Soto (Miguel Cotto Promotions), Freddie Roach (Cotto’s Trainer), Gary Shaw (Gary Shaw Productions), Graham Shaw (Geale’s Trainer), Brett Yormark (CEO of Barclays Center and the Brooklyn Nets), Peter Nelson (VP HBO Sports Programming), David Berlin (Executive Director of the New York State Athletic Commission) and Ululy Martinez (Vice Chairman of the National Puerto Rican Day Parade Board of Directors). 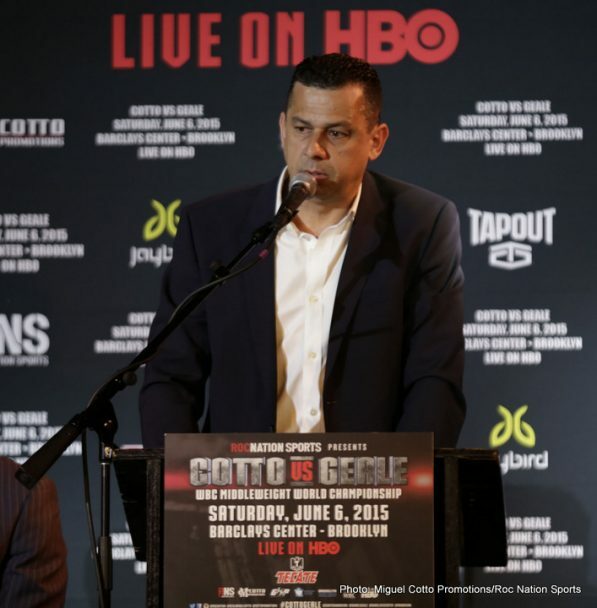 The press conference was emceed by Brooklyn Nets Public Address Announcer David Diamante. 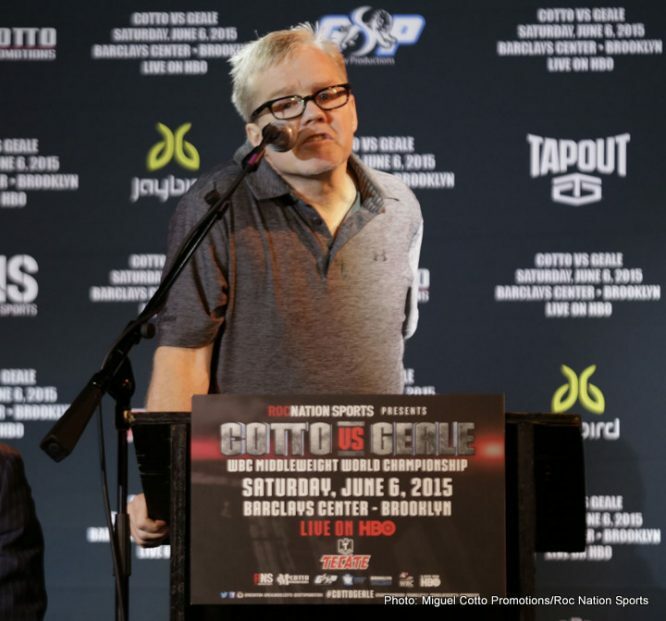 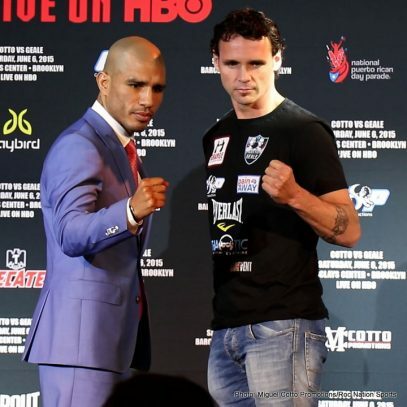 Cotto vs. Geale, a 12-round fight for Cotto’s WBC and Ring Magazine Middleweight World Championships, takes place Saturday, June 6 at Barclays Center in Brooklyn and will be televised live on HBO. 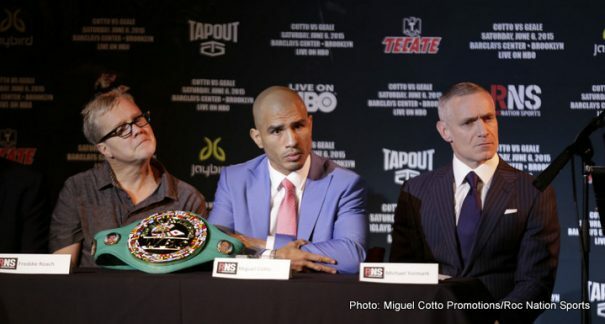 The fight, which is presented by Roc Nation Sports and Miguel Cotto Promotions in association with Gary Shaw Productions, will be the official kick-off event of the 2015 National Puerto Rican Day Parade Week and is sponsored by Cerveza Tecate, Jaybird, TapouT, Tequila Cazadores, Venue Kings and Nüe Resource. 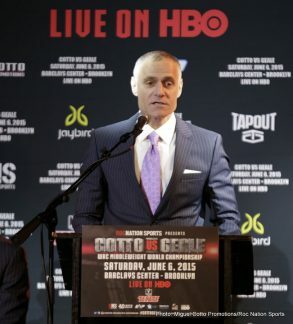 In addition to the great action inside the ring, the event will feature several notable Roc Nation touches that will further serve spectators with an enhanced fan experience, including Roc Nation and Grammy nominated artist Big Sean taking to the ring for a special performance prior to the main event. 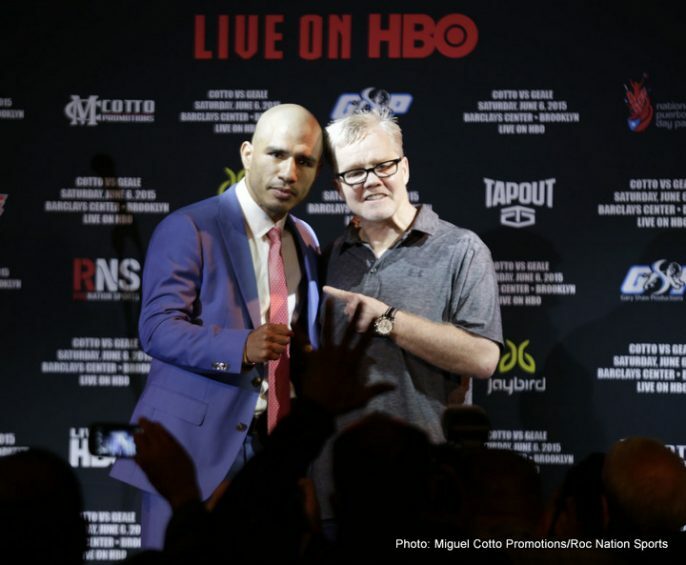 The event will be hosted by notable emcee “The Voice of New York” Angie Martinez and will also feature hit master DJ Lobo who will serve alongside Martinez throughout the night. 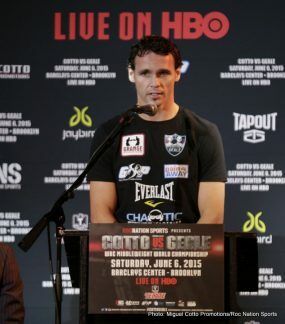 Tickets priced at $500, $250, $200, $150, $100, $80, $50 and $35, not including applicable service charges and taxes, are on sale now and available for purchase at www.barclayscenter.com, www.ticketmaster.com and at the American Express Box Office at Barclays Center. 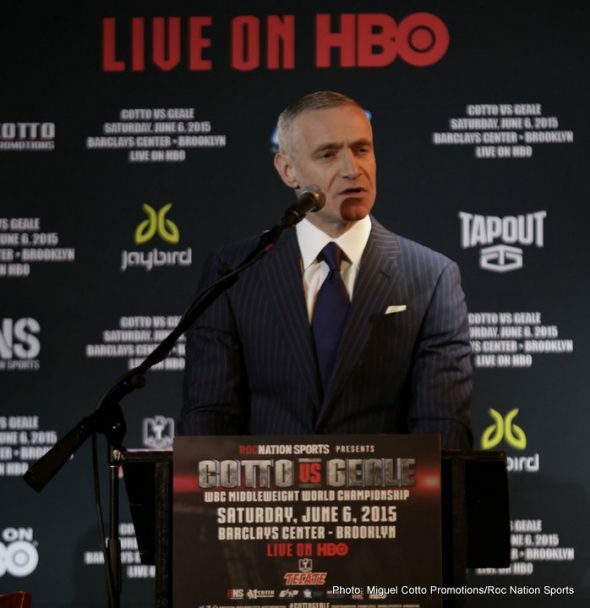 To charge by phone, call Ticketmaster at (800) 745-3000. 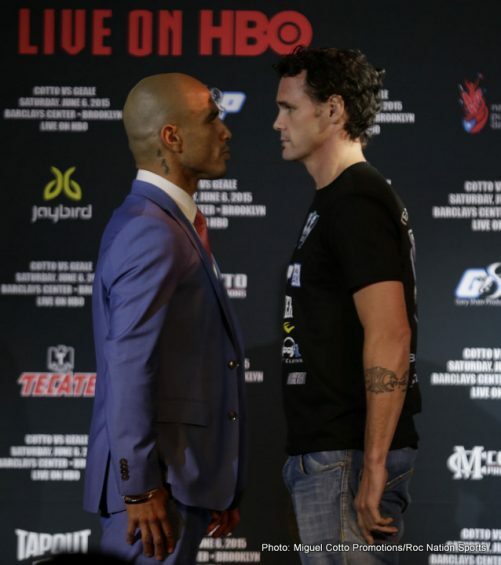 Doors open at 6:00 PM, the first fight begins at 6:15 PM and the HBO telecast begins at 10:30 PM ET/PT. 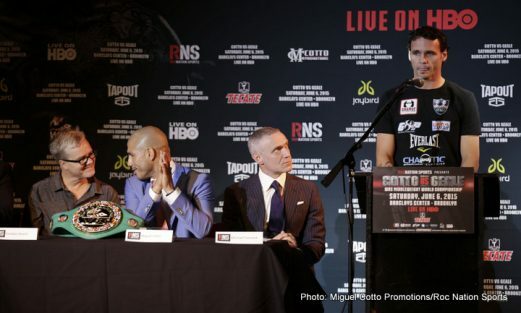 Next boxing news: Amir Khan – King of What?